For Mike Mussina, 2007 qualified as an annus horribilis. After getting cuffed around for six runs over four innings in his first start, Mussina left start No. 2 in the third inning with a strained left hamstring. A trip to the DL kept him out for the rest of April and when he returned in May, he struggled. He was shipped to the bullpen for one appearance in early September, but a thin Yankee rotation hastened his return as a starter and he posted a 3.28 ERA while picking up three wins over his final four starts. It was a good ending, but not enough to salvage the season. The root of Mussina’s problems in 2007 can be found in his strikeout and walk totals. While it seems strange to say a pitcher with just 35 walks in a season has a problem, in Mussina’s case it certainly didn’t help. For his career, he’s walked just 1.99 BB/9, the fifth-best rate among active pitchers with a minimum of 1,000 innings pitched. He’s been even better since 2000, with a walk rate of 1.84 BB/9. But in 2007, his walk rate increased ever so slightly to 2.07 BB/9. Taken alone, that’s not going to be fatal to a veteran starting pitcher. But when you combine the increase in walks with a strikeout rate that tumbled to 5.4 K/9, a drop of more than two strikeouts per game from the previous year (he was at 7.8 K/9 in 2006) it becomes an issue. The resulting K/BB ratio of 2.6 was his worst since 1994. With more batters putting the ball in play, Mussina was at the mercy of his defense. And with his array of off-speed pitches and a GB/FB ratio of 1.15, most of the burden fell on the infield. While we enjoy throwing darts at Derek Jeter’s glovework, it’s true the Yankees’ overall infield defense wasn’t good in 2007 with Jeter, Alex Rodriguez and Robinson Cano all ranking in the bottom third of the league in RZR at their respective positions. Mussina paid the price: Hitters posted a .305 average against Moose in 2007. It was the only time in his career he’s allowed a batting average above .282. Breaking it down even further, in 2007 Mussina surrendered 60 ground ball hits versus 157 ground ball outs. That translates to a .276 batting average on ground balls alone, much too high for a pitcher to expect any kind of success. 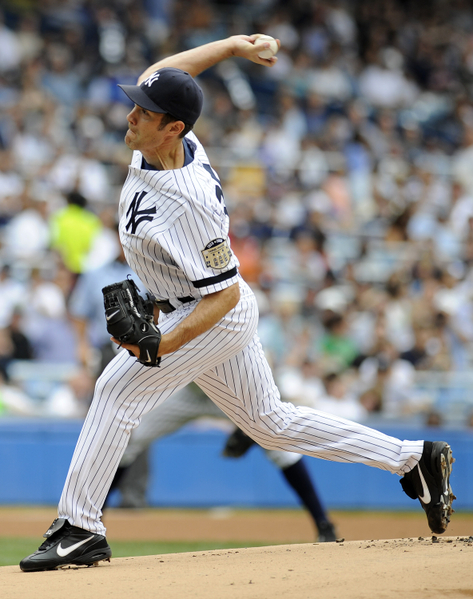 Mussina’s age (he was 38 last year) and the discouraging trends indicated that his career was in an extreme decline phase, if not near the end. Yet, he defied expectations and turned all that around in 2008. Mussina has tightened his control and reduced his walk rate to a career best 1.28 BB/9. While his strikeouts continue depressed, the lack of free passes has become key in his resurgence. It’s amazing that while he’s always had great control, he’s never been this good. Control-wise, this is the best of his 18 seasons by far. It’s also interesting to see that his five lowest walk rates have come in the last nine years—a great indication of how he’s evolved as a pitcher. To maintain a rate that low, you have to avoid even the occasional rough outing. Consistency has been Mussina’s hallmark this season. Mussina has yet to allow more than two bases on balls in any start this year. In fact, if you go back to last September, he has now allowed two or fewer walks in 26 consecutive starts. It’s the second longest streak in the majors, next to Tampa’s Andy Sonnanstine. It’s also important to note that Moose has actually improved his strikeout rate. At 6.1 K/9, it’s not going to set the world on fire, but it is an improvement over last season’s 5.4. As Mussina inches toward his fourth decade, it’s not surprising that he’s lost some of the heat off his fastball or some of the bite off his curve and is striking out fewer batters. He was striking out more than seven batters a game as recently as 2006. But fewer walks combined with more strikeouts has resulted in a positive bump in his K/BB ratio to a highly respectable 4.74. It’s the fifth best ratio in the majors this summer. His graph to the right shows he’s been inconsistent over the last several seasons, but he’s still capable of posting the type of ratio he possessed in his prime. Also key to Mussina’s rebound has been the increased number of ground balls he’s been able to coax. Remember his 1.15 GB/FB ratio he posted in ‘07? This year, he’s trending even further to the ground ball side with a 1.55 GB/FB ratio. Even with a sub-par defense behind him, we can expect his overall number of outs to increase given the fact he’s throwing more grounders. But it’s important to note that the left side of the Yankee infield has improved from last year, while Cano at second has largely maintained his efficiency. When looking at the defensive performance above, keep in mind Mussina’s ground ball numbers from last year (157 ground ball outs, 60 ground ball hits, and a .276 batting average on all ground balls.) This year, Moose has allowed just 46 ground ball hits compared to 155 ground ball outs, which translates to a .229 batting average. You know the stories about quarterbacks buying their offensive linemen steak dinners or fancy watches for keeping them off the turf? Mussina might want to do some Rolex shopping for his infield. Given his performance in 2006 and now this year, we’ll most likely look back at 2007 as an outlier. While he has made an amazing comeback, it’s not unprecedented. Normally, when a pitcher of Mussina’s age shows an across-the-board decline in his key rates as he did in 2007, it’s the beginning (or hastening) of the end. Old pitchers in steep decline don’t get the opportunity to reverse their fortunes. In the history of the game, only three other starters over the age of 35 rebounded from an ERA higher than 5 with a sub 3.50 ERA. Mussina is seeking to join that exclusive club. Wiz, as Kremer was known, was a late bloomer—his rookie year, in 1924, he was 31. However, he was good enough to pitch in parts of 10 seasons, all with the Pirates, and finished third in the NL Most Valuable Player voting in 1926 when he led the league with 20 wins and a 2.61 ERA. Kremer is on many of the Pirates franchise leaderboards, including wins (143 is ranked eighth), and innings (his 1,954.2 innings are 10th highest in Pittsburgh history.) It’s interesting to note he was an extreme “pitch to contact” starter who never struck out more than 74 batters in a season. The second starter with a similar rebound late in his career was Bert Blyleven. In 1988, at 37, Blyleven had his worst season of an illustrious career, posting a 5.43 ERA for the Minnesota Twins. Traded to the California Angels that winter, Blyleven responded with a 2.73 ERA and 17 wins. That was his last great year. He won eight games with a 5.24 ERA in 1990 and missed all of ’91 after undergoing surgery on his rotator cuff. He closed out his career with a 4.74 ERA in 1992. More on him in a moment. Finally, the amazing Jamie Moyer had quite the turnaround when he shaved nearly two points off his ERA from 2000 to 2001. Moyer was 37 when he was Seattle’s Opening Day starter in 2000. His season quickly went sour—he was plagued by shoulder problems and missed half of April and all of May before finishing with a 5.49 ERA. Returning healthy for the Mariners in 2001, he won 20 games for the first time in his career and finished with a then career-best 3.43 ERA. Interestingly, Moyer has a chance to “rebound” again this year at age 45. Last season, he finished with a 5.01 ERA for the Phillies and is currently sporting a 3.78 ERA. With a 2.90 ERA since June 6, Moyer is coming on strong. It’s possible we could have two historic turnarounds in one year. No matter how the rest of this season plays out, Mussina (with a little help of his defense) has made an outstanding comeback. Walking fewer hitters and throwing more ground balls than ever, he’s enjoying a late career renaissance that few thought was possible after a disastrous 2007 season. With roughly nine starts remaining, Moose has positioned himself to win 20 games for the first time in his career. Should he reach that plateau, he will finish the season with 270 wins to his credit. Of the 20 eligible pitchers (since 1901) who have at least 270 wins and an ERA of 3.70 or less (Mussina’s currently owns a 3.69 career ERA), 17 are in the Hall of Fame. Only Tommy John, Jim Kaat and Blyleven are on the outside, looking in. There will be plenty of time to debate Mussina’s Hall of Fame credentials. For now, raise a glass of wine (perhaps a 1991 vintage) and enjoy one of the more remarkable comebacks in baseball history.